The only thing that may be missing is a print component. Is there a book or publication to mark this momentous landmark? I’m especially curious because Shaw has been open to all races, creeds, and genders from Day One, a most unusual attribute for a college founded in 1865. 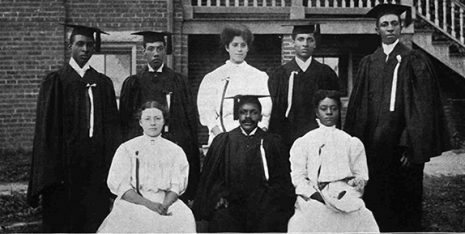 (The photo below shows the class of 1907. My own alma mater, Rutgers College, was founded in 1766 but did not admit women until 1972.) Shaw alums include New York State’s first black legislator, Edward A. Johnson (class of 1891), pioneering pilot and flight instructor Ida Van Smith (class of 1939), and Angie Brooks, president of the UN General Assembly (class of 1950).